Most real estate valuers in London think property prices in the UK capital are about to fall. That prediction has been easy to make and easier to get wrong in the last five years. This time, the evidence that global investors’ favourite housing market has peaked is looking credible. House prices in London as a whole are still rising on a monthly and annual basis, and are 20 percent more expensive than a year ago, according to the Office for National Statistics. But there is stasis in the process upstream. The Royal Institution of Chartered Surveyors’ latest monthly survey shows a sharp dip in those wanting to buy in London, and an even sharper jump in those keen to sell. Monthly sales volumes are off 17 percent in Greater London since December, says the Land Registry. A small majority of RICS’ members now expect values in the city to fall in sympathy. The picture is of domestic demand falling away. That is not surprising. Median prices in the capital are 10 times average London earnings, as measured by the Greater London Authority. Banks are reluctant to advance mortgages at multiples exceeding four times salary. Meanwhile, a soft rental market is a deterrent to debt-funded investors. Rents rose just 1.4 percent in the year to March; lowly rental yields are below mortgage finance costs in some parts of the market. And UK rates may rise later this year. This leaves the London sales market open only to those with sizeable cash resources. The city has attracted hordes of such buyers globally in a period of financial repression. But if the buyer-seller imbalance has shifted, this foreign money will need to work harder for prices to hold. The snag is that London is no longer a bargain for the global buyer. A 15 percent charge on properties bought through tax-avoiding corporate shells has already hit demand, the city’s real estate agents say. Sterling has risen 15 percent against the dollar since July 2013. There is a near-sacred belief held in the UK, London and internationally that house prices in the city can only rise. That view might not withstand the economics of supply and demand. 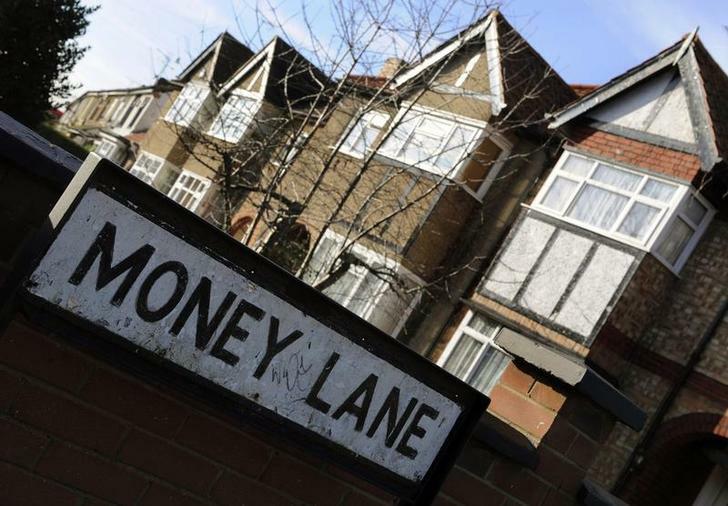 Houses are seen behind a residential street sign in London. A majority of London property surveyors expect prices in the capital to fall over the next three months, with the market experiencing a much greater quantity of sellers and a much reduced quantity of buyers, the Royal Institution of Chartered Surveyors said on July 11. A positive net balance in RICS surveys implies that more surveyors are seeing increases than decreases in the underlying variable, while a negative net balance implies that more are seeing decreases than increases. Between January and June, the balance of buyers has turned from +30 to -30, while the balance of sellers has increased from -20 to +45. Over the same period, the balance of surveyors expecting price rises in the next three months has changed from +70 to -10. UK mortgage approvals fell to 61,707 in May, according to Bank of England data. In January they stood at 75,838. Sales volumes in London were 11,221 in November, according to Land Registry data. In March, the last recorded month of data, they stood at 8,745. The sterling/dollar exchange rate was 1.49 on July 8, 2013. It now stands at 1.71. London house prices rose 20.1 percent in the 12 months to May 2014, the Office of National Statistics said on July 15.